Very nice drapes. Thicker, high-quality fabric. A very good value. We hung them in a guest room and they do keep out most of the light. The fabric hangs very nicely. Redesign your living space with this fun and versatile curtain panel. Crafted from 100-cotton, this panel features a taupe geometric print. 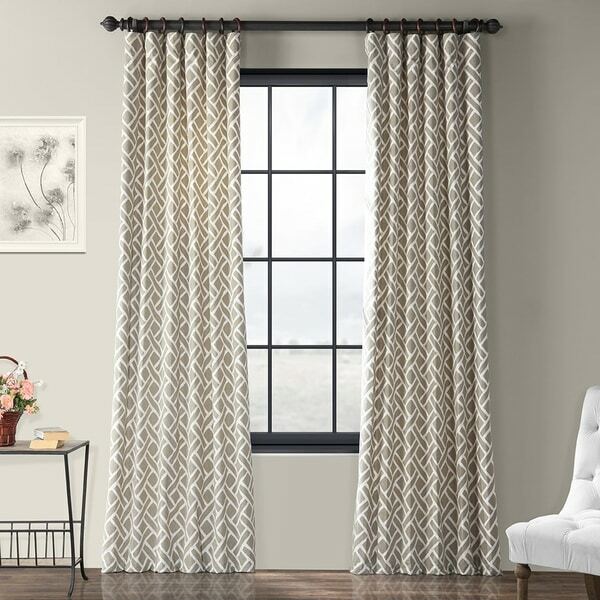 These curtains are lined and feature a rod pocket and back tab for easy installation. The printed cotton twill is made from 100-percent high-quality cotton, giving it a softer hand feel than the Half Panama fabric.It also has a heavier drape, giving it better overall appeal once finished with a weighted hem and the shade-enhancing lining. Dimensions 120.0 In. X 50.0 In. X 0.25 In. I purchased these panels in yellow. They are heavy and good quality. I would highly recommend. I ordered this after reading the other high reviews, and I am very glad I did. I was quite impressed with the weight of the fabric and the lining was exceptional also. They hang beautifully and are well worth the money I spent. I would call the color greige and white. They are fully lined to protect them from sun damage, which is something I consider when buying window coverings. I have the 108 length for my window, and they do have some weight to them, so you will need a sturdy rod set. 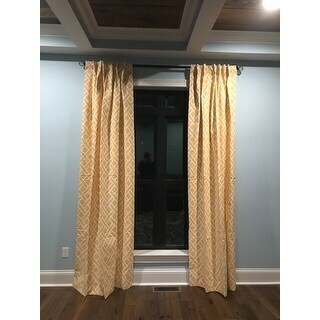 I was very pleased with these drapes, they have a nice drape to them, they are lined with a cream color and hang wonderfully. Fabric is very nice. These curtains are beautiful and very well made. They exceeded my expectations. Nice but more gray than taupe. Sent back. Just what I hoped for. Thick fabric with some texture to it. Well sewn and lined. Not black-out though. I am so pleased with this drape, cotton lined with weight at bottom. I bought the taupe and white, they look great in my family room. Fabulous upper scale drapes. Keep sun out and will block wind. Heavy duty. Love them . I love these in my kitchen. I ordered the samples prior to my order. Thank you for offering the samples. It was a huge help. Great quality. Lined. Hung out well after removing from package with minimal touch up with steamer. 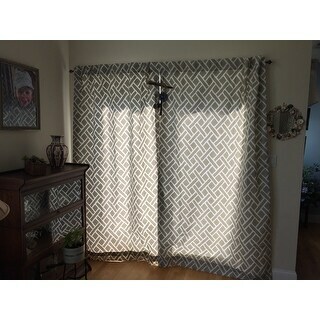 Great quality, lined drapes. Bought the gold and LOVE them. These are beautiful curtains, heavy and look more expensive than they were. They are for our living room which is very dark color, the color contrast of the geometric pattern matched well. Love these drapes, great fabric, much nicer than I was expecting. They are lined but do allow some light through which is fine with me. I ordered these in aqua mostly because there used to be a Q and A on this page that stated that the aqua color was a pale blue. (That conversation seems to have been deleted.) These drapes are definitely far more greyish green than blue. As a comparison, they are considerably greener than Benjamin Moore Glass Slipper. They are lovely and seem well made, but if you are looking for a bluish aqua or sea foam, these may be too green. "Can I request a fabric sample?" Yes, you can request a fabric swatch by clicking the blue "Request a Free Swatch" link on the product page below the "Add to Cart" button. "Am considering purchase of the gray/grey ones and am wondering if the white could be best described as a pure white rather than an cream or off-white? Also, exactly what colour is their lining? Thank you!" The white on the face fabric is an eggshell color. The lining is a soft white. "What type rod did you buy with this???.. i dont want to get hooks." You can use any rod you like if you want to use the rod pocket or tab option on the panels. Rings are an alternate third option you would choose if you'd like to be able to open and close them easily on a daily basis. "Do you know if you will receive more in stock you have 5 left i would need at least 10-12 panels Thanks"
"How wide is this curtain? Thanks!" This curtain panel is approximately 50 inches wide. "I would like to order these for my dining room sliding glass doors (standard doors, approximately 70.5"). How many panels would you recommend?" To calculate how many panels are needed for a space we recommend multiplying the width 2-3 times. That will give you the amount of fabric needed to create a full look. "Do these come as a pair or a single panel?" This is one single panel.